Live by the sword, die by the sword: knights were some of history’s most brutal warriors. With an armor of steel and a will of iron, they took part in some of the bloodiest battles ever fought. So dedicated were these warriors, that between meets they would challenge one another to extreme trials of combat. “Knight Fight” introduces both beginner and expert armored athletes of different ages and backgrounds – many taking this on as a second profession – ready to endure a ruthless, intense and physically demanding tournament. Targeting a specific time-period each episode, “Knight Fight” examines the Vikings vs. Byzantine Knights, Barbarians vs. Roman Knights, Knights Templar, 100 Years War and much more. Reso is joined by expert judges Andre Sinou, Co-Founder and Creator of the Armored Combat League, and John Clements, Director of the Association for Renaissance Martial Arts. Impressing the judges on the criteria of aggression, technique and defense in each of the following rounds will be no easy feat: the grand melee, three one-minute battles where it is every man for himself; a two on two team melee and a duel where the final two competitors left standing face off in an epic head to head clash. With $10,000 on the line and a coveted title, only one can emerge victorious. Yeah, I'm nearly 50 with three herniated discs in my neck. I think joining "Knight Fight" would be short-lived and fatal. But thanks for thinking of me! Anyone wanna buy a shield? Won't you need the shield? This looks great. 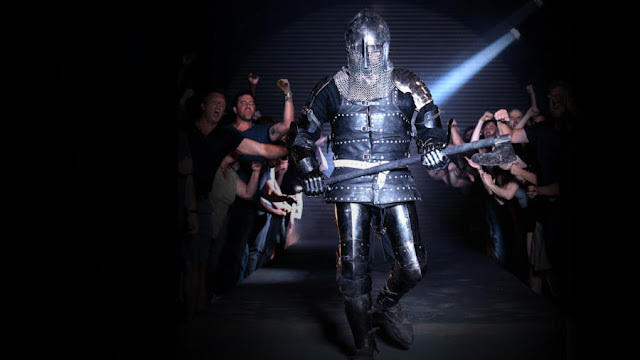 We can finally settle all of those internet arguments of "Who would win," such as "Would a guy dressed in Viking gear be judged to have beaten a guy dressed in Knightly gear in a controlled, judged fight using non-lethal techniques?" Wait, is that not the argument? I can make more, turns out. The hardest part, ironically, is the goat skin. Kickstarter - Treacherous Traps for 5th Edition!